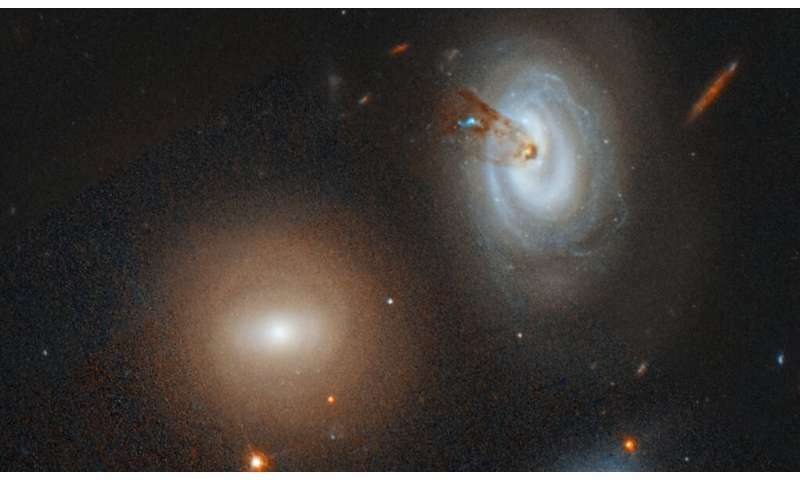 The spiral galaxy D100, on the far right of this Hubble Space Telescope image, is being stripped of its gas as it plunges toward the center of the giant Coma galaxy cluster. Courtesy of NASA, ESA, M. Sun (University of Alabama), and W. Cramer and J. Kenney (Yale University). A new study led by Yale University astronomers tells the story of a galaxy that ran out of gas. It's a story as old as the universe itself: A galaxy is born, brimming with new stars, its spiral arms stretching and curving. But then it runs into trouble, veering too close to the center of a nearby galaxy cluster. The surrounding cluster begins to siphon off the galaxy's star-making gas, until it loses its spiral arms and becomes a dead relic. That's what happened to a galaxy called D100 in the massive, Coma galaxy cluster, starting roughly 300 million years ago. Images from NASA's Hubble Space Telescope allowed researchers to see the phenomenon in unprecedented detail. "This galaxy stands out as a particularly extreme example of processes common in massive clusters, where a galaxy goes from being a healthy spiral full of star formation to a 'red and dead' galaxy. The spiral arms disappear and the galaxy is left with no gas and only old stars," said William Cramer, a graduate student in Yale's Department of Astronomy who led the new research. "This phenomenon has been known about for several decades, but Hubble provides the best imagery of galaxies undergoing this process." The process, called "ram pressure stripping," occurs when a galaxy falls toward the dense center of a massive cluster of thousands of galaxies. During its plunge, the galaxy plows through intra-cluster material that is even more dense. This material pushes gas and dust—star-making fuel—away from the galaxy. Once the galaxy loses all of its gas, it meets an untimely death because it can no longer create new stars. In the Coma cluster, this violent gas-loss process occurs in many galaxies. But D100 is unique, note the scientists. Its long, thin tail, for example, extends nearly 200,000 light years—about the length of two Milky Way galaxies. In addition, the tail is narrow, only 7,000 light years wide. "The dust tail is remarkably well-defined, straight, and smooth, and has clear edges," said Yale astronomer Jeffrey Kenney, a co-author of the study. "This is a surprise because a tail like this is not seen in most computer simulations. Most galaxies undergoing this process are more of a mess. The clean edges and filamentary structures of the dust tail suggest that magnetic fields play a prominent role in shaping the tail. Computer simulations show that magnetic fields form filaments in the tail's gas. With no magnetic fields, the gas tail is more clumpy than filamentary." The Subaru Telescope in Hawaii uncovered the long, glowing hydrogen tail in 2007 during a survey of Coma cluster galaxies. But astronomers needed Hubble observations to confirm the hot gas was a signature of star formation. "Without the depth and resolution of Hubble, it's hard to say if the glowing hydrogen gas emission is coming from stars in the tail or if it's just from the gas being heated," Cramer said. The researchers' main goal was to study star formation in the tail, which was fueled by D100's ongoing gas loss. However, Hubble did not find as many stars as the team expected, based on the amount of glowing hydrogen gas contained in the tail. The brightest clump of young stars in the middle of the tail contains at least 200,000 stars. The Hubble data shows that the gas-stripping process began on the outskirts of D100 and is moving in towards the center. Based on the images, the gas has been cleared out all the way down to the galaxy's central region. Another image reveals D100's eventual fate. It's an image of galaxy D99, which underwent the same violent gas loss that D100 is now undergoing. All of D99's gas was siphoned between 500 million and 1 billion years ago, and its spiral structure has mostly faded away. "D100 will look like D99 in a few hundred million years," Kenney said. The Coma cluster is located 330 million light years from Earth. The study appears in The Astrophysical Journal.